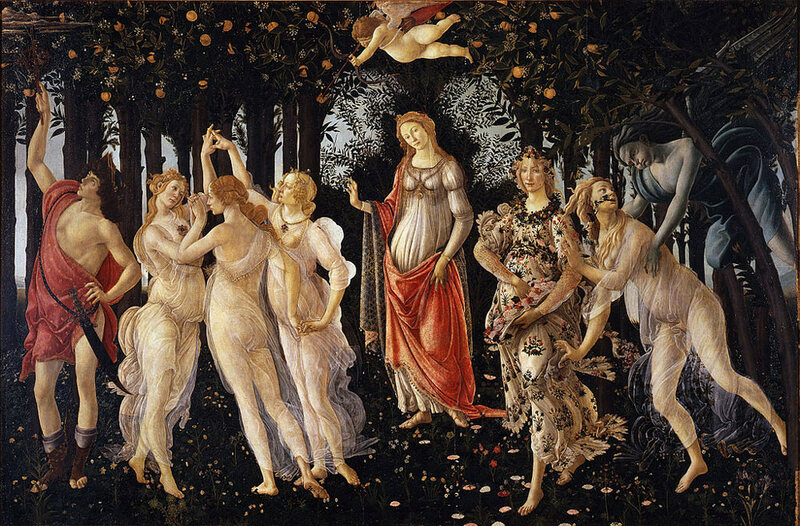 The Primavera was painted by Italian artist Sandro Botticelli in c. 1482. This egg tempera wood panel painting is depicted as a famous painting of the western world. It is also a very publicized and debated work of art in the world. Most commentators concur that the painting which depicts figures in a garden is symbolic to the lush spring growth. There have been other meanings which were examined. One such explanation that was entertained is the idea that the piece of art portrays the idealistic love of the Neoplatonicism. Although the exact history of this work is yet to be known with certainty it appears the artist might have been contracted by a Medici family member. The painting might bear elements of a Roman poet named Pubilus Ovidius Naso and the Roman poet and philosopher Titus Luceritus Carus. In the painting there are six figures of women and two of men, and a blindfolded chubby male child with wings. On the right of the painting stands a female with a crown of flowers and wearing a floral dress and scattering flowers enfolded in her dress. Standing very near is a woman in a gossamer white gown that is being captured by a male figure with wings above. The winged male intently concentrates on the task at hand, his cheeks puffed and having an unnatural complexion makes it seem that this figure does not belong with the others. The trees around the seemingly menacing figure move their branches toward the man while blowing in his direction and the woman he is gripping. The covering of another woman’s dress blows in the opposite direction. Gathered on the left are three females who hold each other’s hands and dance together while a male youth wearing red and wielding a sword and wearing a helmet extends a wooden rod toward fading clouds. A couple of the women are wearing noticeable necklaces and the chubby winged cherub has an arrow notched and aimed at the dancing girls. In the center and somewhat apart from the others, a woman stands wearing a blue dress with a red cloak. She is like the female scattering the flowers returns the gaze of those who look at them while the vivid scenery is completely detailed. Several hundred different species of plants and flowers are portrayed in the magnificent work of art. Various analyses of the painting have been speculated yet it is generally agreed upon that the painting is an elaborate symbolism of the blossoming fruitfulness of the world. The orange trees are representative of the Medici family. The painting is said to have been made for a member of the prominent family. The painting itself is the allegory of spring. The figures, from left to right, are Mercury (Hermes in Greek mythology, but some recognize him as Mars), the Three Graces, Venus (Aphrodite in Greek), a cherub above her, Flora (the Roman goddess of spring), Chloris (a Greek nymph associated with spring) and Zephyrus (the Roman god of the west wind, or first wind of spring).